OdorOut-222 is a completely Non-Toxic and Environmentally safe organic based stain and odor remover. It is safe for use around people, pets, marine life and plants. It may be used on pet beds, litter boxes, carpets, car and truck interiors and more... This formula does NOT contain alcohol, heavy perfumes or any toxic chemicals. OdorOut-222 is NOT an air freshener that simply masks or covers up the odor; it eliminates it! The proprietary non-pathogenic bacteria formula penetrates the odor molecule and consumes it. 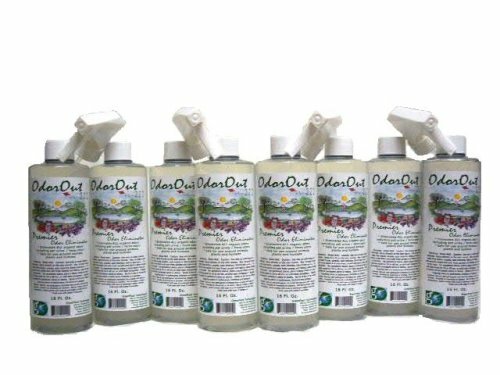 This completely eliminates the source of all organic based odors and stains including pet odors, feces, blood, urine, vomit, mold, mildew, smoke, fish and ANY organic-based odors and stains. Completely Non-Toxic Formula Safe For Use Around Pets, Plants and People! Completely Eliminates All Organic Based Stains and Odors! Easy To Use! Spray Directly On The Source Of The Odor Or Stain. OdorOut-222 Is NOT An Air Freshener! It Eradicates The Organic-Based Odor Or Stain.